A large amount of collected recorded data for 2013 has been correlated. The year average background was 22% above the 4 year pre Fukushima average. This is only a very marginal 1% increase over 2012 year 21% increase. January 2013 had the highest monthly increase. The 2013 year average suggests that at present, the Southern Hemisphere increase at the monitoring location has stabilized. A lot of rain water and car bonnet swabs were conducted during the year. At the beginning of the year, these Geiger counter and scintillator tests manly detected Radon-222 decay daughter isotope washouts, with traces of Beryllium Be-7, Lead Pb-210, Iodine I-129 and Uranium U-235. In July, traces of Thorium Th-234 were detected, plus in September, Radon-220 decay daughter isotopes were also detected for the first time. 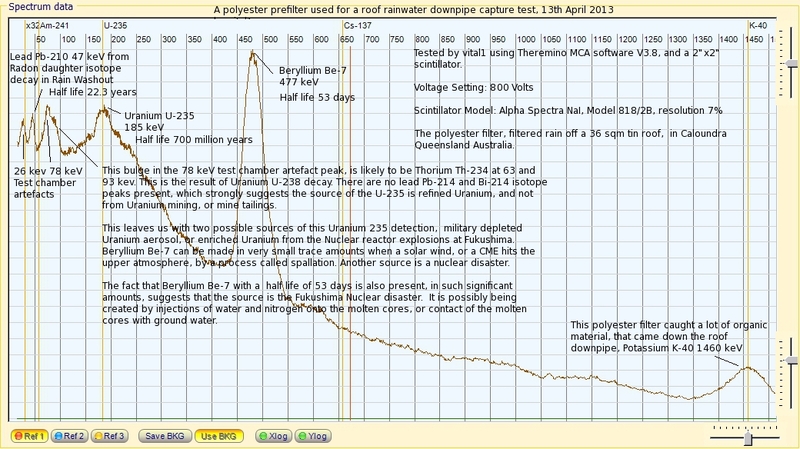 If traces of U-235 were detected, it means a lot more Uranium U-238 was in the atmosphere. The detection of I-129 is also of concern, even if it is in trace amounts. Testing Results can be found here. It is suggested that those who are using tank water should have very good water filters in place, and those on town water use a good reverse osmosis water filter. Also wash your fruit and vegetables well before cooking and eating. This test chart is from the roof down pipe filter, http://sccc.org.au/down-pipe-filter-design, that was in place all November. Just a couple of showers and storms for November at this location, not much rain mainly dry. 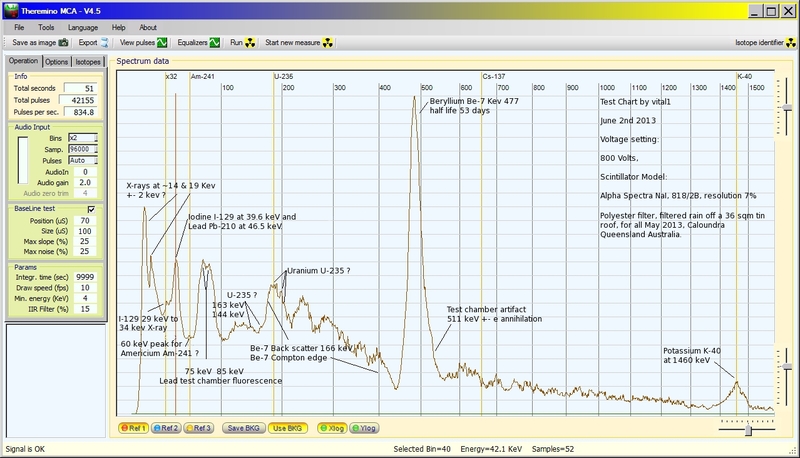 Scintillator testing shows the most significant peaks were for radioactive Lead Pb-210 and Beryllium Be-7 isotopes, plus a small trace of Uranium U-235. The rain swab collected on the 30th November and tested on the 31st, was interesting in that there were significant detections of both Radon-222 and Radion-220, plus possibly a trace amount of Cobalt Co-57. On the 23rd and 24th of November, there were significant increases in background radiation, detected here. It was 46% above the 4 year, pre Fukushima recorded average. Above 40% is considered an alert level by the station operator. What do these local alert levels mean, and how are they determined ? These alert levels are set by the station operator, and are not based on any government alert level. November 2013 day average chart. Here is November 2012 day average chart for comparison. Large cloud masses were flowing from the tropics, from around Darwin to the East Coast of Australia, during this period. The long term data shows the frequency of these events increases at this location during the warmer months, from November to March. This appears to be the time when there is an increased Northern Hemisphere air exchange through the equatorial barrier. It is suggested that during these periods of elevated free air background radiation detections, to stay out of the rain. Here you will find local rain tests results explained in detail, plus why it is suggested to stay out of the rain during these elevated detection events. Assuming that the Fukushima Nuclear disaster has a similar dispersion model dynamic to the atmospheric Nuclear bomb testing period, 5 times more fallout will occur in the Northern hemisphere than the Southern hemisphere. Detailed Southern Hemisphere monitoring station data can be found here. A list of live International monitoring stations can be found here. October 2013 month average was 25% above the 4 year pre-Fukushima October average, and 6% above October 2012. October here was a very dry month, so all the increases were from free air detections. There were no significant Radon washouts during this period. September 2013 report on local background radiation levels, and rain test results. It was very dry in September with storms passing through on the 17th. The September 2013 month average was 2% above September 2012, and 15% above the pre Fukushime 4 year average. This means most of the detected local background increase was from free air detections, and had nothing to do with possible radon washouts. You can see that the chart became much more dynamic towards the middle of September. This dynamic has occurred in previous years, and correlates with more Northern tropical air breaking through the equatorial barrier, in the warmer months and generally peaking in December, January, February and March. August 2013 report on local background radiation levels, and rain test results. There is no rain test for August, because there was no rain here, but there has been a significant detection of radioactive I-129, in a sample of roof gutter moss growing here. The August 2013 month average was 8% above pre-Fukushima levels, but 1% lower than August 2012. 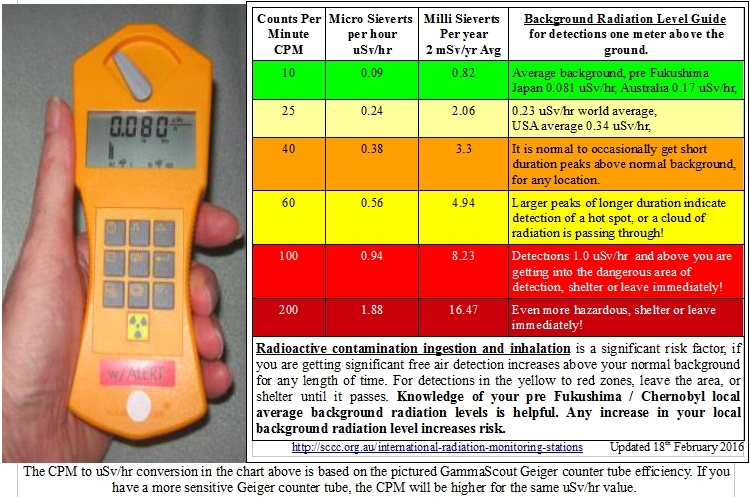 July 2013 report on local background radiation levels, and rain test results. The Fukushima Nuclear disaster site has been getting very unstable. In early July, possible fires were seen on Fukushima webcam. There also have been lots of large steam events witnessed recently on the Fukushima live webcams. These events seem to be following a two week cycle at present. Thanks to enenews webcam forum commenter ‘pure water’ for the screen shots of the possible fire at reactor 3. One other suggestion is it is not a fire, they were burning off Tritium near the reactor 3 building. Radioactive Iodine I-131 was also detected in sludge in nearby cities. There were also increased levels of Tritium, Cesium and Strontium, detected in recent tests of water from bore holes at the Fukushima nuclear plant. This all points to the possibility that underground criticalities are occurring, or have occurred, recently at the Fukushima Nuclear Disaster site. Here is a list of International radiation monitoring stations if a major event happens at Fukushima. Headline in a recent Japanese news article. Shocked, really! Anyone who has taken any notice of what has been happening at the Fukushima Nuclear disaster site from the very beginning, would not be shocked. Contamination has flowed into the Pacific Ocean for 28 months now. They use the word leak, to play it down. Their estimate is 800 tons a day of ground water is flowing into the Pacific Ocean. This is probably a very conservative estimate! It’s a flood, not a leak! Under the Pacific Ocean heading, at either sites below, to see the magnitude of these contamination reports. It is important to keep an eye on reports at these two sites, so you know what to avoid. There are new reports being posted constantly. Contamination detection reports of Korean and Atlantic Canadian seaweed are two of the very newest. July’s 2013 month average was 6% above the pre Fukushima nuclear disaster four year average. It is lower than July 2012 month average of 9% above. Local radiation levels have been relatively lower during winter months here over the last couple years. Our theory for this seasonal change is that less air breaks through the equatorial barrier during the winter months. There were very small traces of Iodine I-129, Lead Pb-210, Uranium U-235, Thorium Th-234 and Beryllium Be-7, detected in this month’s rain test. It was in smaller amounts compared to previous months. June 2013 report on local background radiation levels, and rain test results. Here are the June charts for this location, day averages, 2013 month averages, and for comparison, the 2012 month averages. The June 2013 local background radiation level was 7% above the 4 year pre Fukushima June average. Junes local rain water test detected Beryllium Be-7, Uranium U-235 ?, Lead Pb-210, and possibly I-129 in trace amounts. (See test chart). At the location here, June was a very wet month, with over 300 mm of rain. A lot of water went through the filter. Even so, the amount of these isotopes that were detected, was less than previous months. May 2013 report on local background radiation levels, and rain test results. The May monthly average was 7% above the pre-Fukushima monthly average. This is the same as May 2012. (See charts below) This would suggest that at our location, background radiation levels have stabilized for the time being. May be a detection of Iodine I-129 from the tin roof down pipe polyester filter. It is not conclusive. Rain water was passing through this polyester filter off a 36 sqm tin roof at a location on the Sunshine Coast. If it is, it is still a very small detection of I-129, because the filter was in place for all of May. Mind you, not all of it would have been captured using this filter system. Lots of Beryllium Be-7 is also present! If I-129 is present in this Southern Hemisphere test, it would suggest that there is a lot more in the rain in the Northern Hemisphere! For background on this subject, read this article on using Be-7 as a tracer for I-129. There is a natural Beryllium Be-7 and Lead Pb-210 cycle here in the Southern Hemisphere. There is more Beryllium Be-7 and Lead Pb-210, detected in rain washouts, during summer than in winter. This appears to be an above average detection of Beryllium Be-7, and Lead Pb-210 in this test for May 2013. Be-7 is produced by cosmic ray spallation in the upper atmosphere. The Sun had been relatively quite during May 2013. It takes around two weeks to reach sea level. It is my understanding that the Japanese have been pumping large amounts of liquid Nitrogen onto the multiple molten coriums at the Fukushima Nuclear disaster, to cool them down. The neutron bombardment, plus lots of underground corium venting, has also been releasing large amounts Beryllium Be-7 and 1-129. 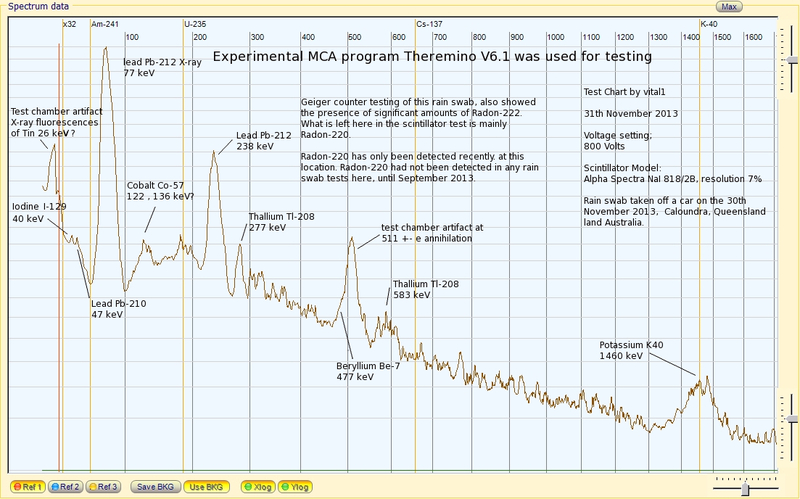 Test chart using experimental Theremino MCA V4.5 software. This is a reply by poster Potrblog on http://www.enviroreporter.com I think it is a very good answer to the questions above. Iodine supplements are not for everyone. We are all different. Some people taking them can get adverse side effects. No one should take them without medical advice from their doctor. The possible I-129 detection here is very small, and not conclusive. 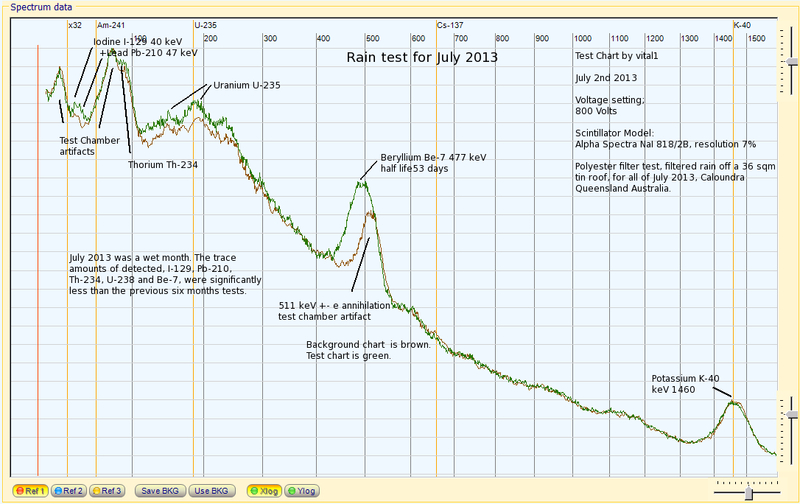 The other isotopes detected in the May rain test are also of concern, but at trace levels at present. Beryllium Be-7 being the most prominent. Which brings us back to the Radon daughter isotopes, Uranium U-235 and Beryllium Be-7 as the main detected components in the latest April rain tests, collected at this location. Even though the refined Uranium was detected is in trace amounts, its presents is of considerable concern. As the seasons change from summer to winter, the Northern Hemisphere mixed tropical air is replaced by the southern ocean air flow, and our radiation levels drop. This month saw lower background day averages than the January (52%) and February (39%) highs. The whole month background average was 32% above the 4 year pre-Fukushima March background average. It was also higher than last March’s (2012) month’s average of 24% above average. A few day averages towards the end of the month went to 40% + above average. See attached charts. The local Sunshine Coast monitoring station site colour coded alert levels are set in 40% increments. For every colour alert level increase, there is a 0.96 uSv exposure increase for that whole day. Two new privately run live monitoring stations have been set up on the Sunshine Coast Australia. One in Central Caloundra, and one at Golden Beach. Golden Beach is about 5 Km away from the Caloundra station. These live charts can be accessed from the table at the top of the page under Tools heading here, http://sccc.org.au/archives/2630 or directly via this link. Live chart images are uploaded to a special FTP site that has been set up. Chart images sent to the FTP site are then placed in the central monitoring station web page. If an event happens, an email alert or advisory is sent, you will be able to see what is happening in real time at that location. Stations like this can provide background monitoring information from anywhere in the world. It just needs people to purchase and set up their own Theremino kit or equivalent, and then send the chart images up to the FTP site regularly. We hope to have more stations up and monitoring, in the future. If any of you are interested in setting up a monitoring station, please email me, and I will forward set up information. After doing a lot of research on this subject, I suggest using the Theremino Geiger kit. A Theremino Geiger counter station can be set up for as little as $90 or less using a SBM-20 Russian tube or equivalent. It is as good as commercial units, but a lot cheaper. You will also need a computer and a permanently connected Internet connection. The Theremino Geiger Counter kit can also be used as a normal Geiger counter, to monitor items coming into your home. Some technical skills are involved in putting it together and setting up the software. If enough stations get added, an interactive map will be created. “Is then, the whole of Australia also contaminated with radiation?” No! 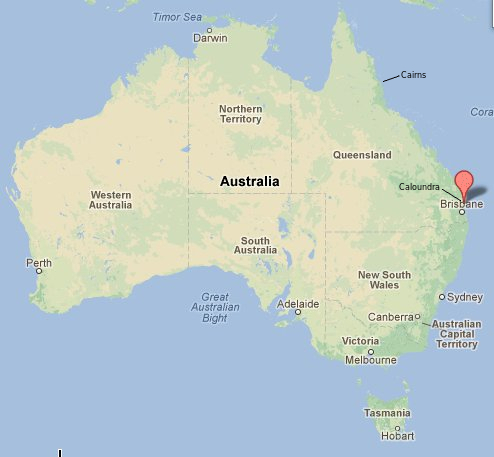 A lot of these detections reported for Australia are very localized. Even with a recent record day average of 0.213 uSv/hr, which is 113% above our average local background, it is still lower than a lot of places in the world. It much lower than the USA national average of 0.34uSv/hr, and lower than the world average of 0.23 uSv/hr. What the increasing day average detections here do indicate, is that our local background radiation level is increasing. Our traditional lower levels lets us detect small changes. So far, most of the increases here, seem to be increasing Radon levels in the atmosphere. The dynamic is changing, so constant testing is continuing. Read the October 2012 monthly report below, for a couple of theories why Radon levels may be increasing. Our local background month average for February 2013 was 39% above the pre-Fukushima 4 year average. It was not as much as the 52% above average for January 2013. 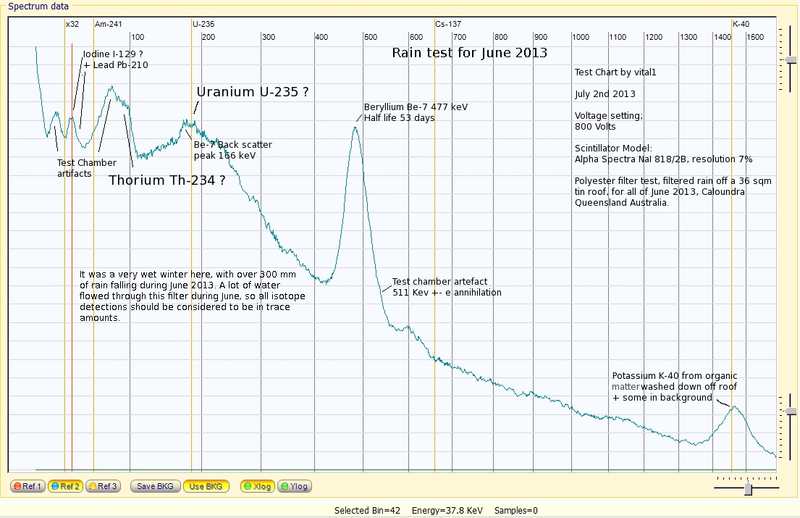 Beryllium Be-7 and traces of Uranium U-235, were found in the latest rain washout capture test here at our location. 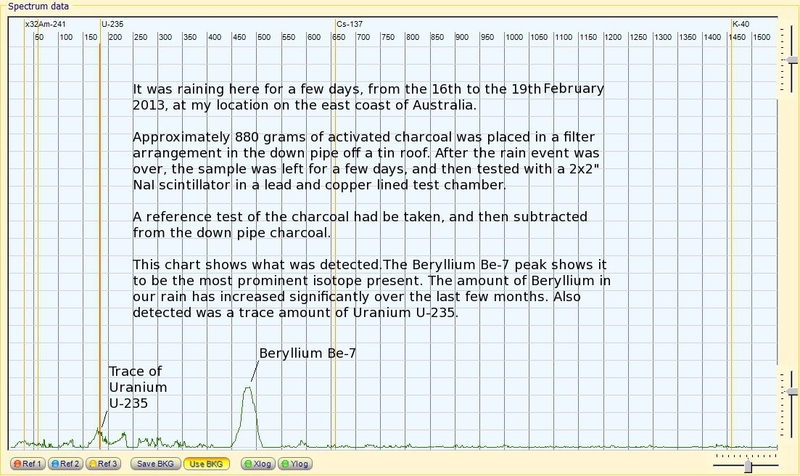 The mystery isotope detection we reported in the last email report, appears to be Beryllium Be-7 at kev 477. From research on the subject, there appears to be two possible sources for Beryllium Be-7, from liquid nitrogen injections onto the molten nuclear cores at Fukushima, or from a solar wind hitting the earth’s upper atmosphere. It has been a relatively quite period for solar activity recently. A lot of water flowed through this charcoal, in the down pipe, to get these detections. (Down pipe activated charcoal filter design). These are small detections considering the volume of water that passed through the activated charcoal filter. 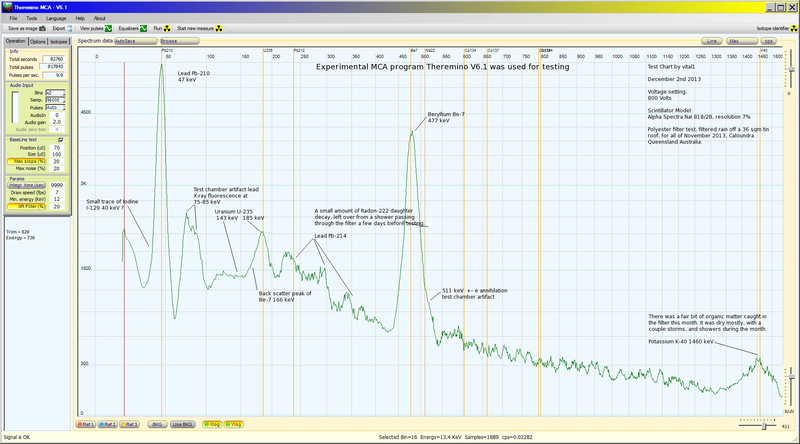 The other very small peaks showing in this chart could possibly be trace detections of other isotopes. At these small detection levels, they could also be created by a bit of random variation in counts in the background level, over the time of the tests, showing up in the tests results. Here is a Twitter of a 2012 monthly average radiation level chart for Fukushima city, showing the increasing radiation levels there. Interestingly, it mirrors the monthly chart recorded at my location in the Southern Hemisphere. Obviously at my location it is at a lot lower levels, but both chart curves are very closely tracking each other. This is last year 2012 monthly average chart at my location. This January 2013 month average, is 52% above the pre Fukushima monthly average. The highest monthly average I have ever recorded here. If I am correct, and it is tracking, then there have been large releases of Radiation at Fukushima in January and December 2012, and January 2013. It would seem if something major has happened at Fukushima, I appear to detect it using this very detailed data collection process. There were also alert level detections on the northern New South Wales east coast. This happened at the end of January, during the flooding rain event, that came down the east coast of Australia from the tropics. We are investigating what caused these elevated detections. Go to the local monitoring site page for more details, on these alert level events. “Is then, the whole Australia also contaminated with radiation?” No!